Information Processing: A hockey coach?!? I find it curious that two out of four states where the top paid public employee is a college president are Alaska and Montana. At some level, it's even surprising that there ARE public colleges in Alaska and Montana. 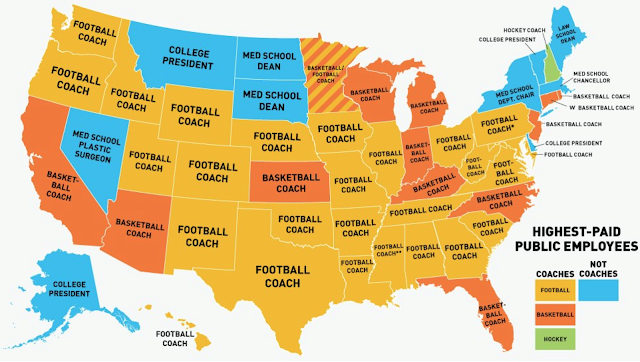 All states equally need well-paid football coaches, but one would expect that college presidents should trump football coaches in states with particularly strong public university systems (like California.) We're seeing the opposite. Imagine if instead of pandering to athletes, legacies, etc, American colleges actually placed a rigorous emphasis on STEM. Instead, we're routinely told by anti-Asian racists that colleges need athletes and legacies in order to cultivate their "brand name" and "prestige". I would guess that, for example, candidates for the president's gig of the UC system suffer from having places like Alabama in the employer pool. Steve with the college administrators are underpaid? I am reminded of this PhD Comic. Love the smell of the free market in the morning. And just think, lots of those university administrators and humanities professors are still overpaid. Two of my nephews in NH played football to get in shape for hockey. Virtually every high school in New England has a hockey rink. Look your new home. I bet all the high schools in MI also have rinks. Don't you mean the smell of already overattended colleges using perfectly reasonable tactics in the war to build larger and larger empires of increasingly more mediocre students? The supposed "sophisticated choices of the free market" are in fact just the "choices" of the free market which may be explained by sophistical reasoning. As far as I know there is only one global institution which rejects both the free market and Communism. That is, The One Holy Roman and Apostolic Man Boy Love Association. Too bad it takes pervs to see the problem. These data are in-line with revealed preference economic theory. How we actually allocate our money is a valid measure of what we actually value. These data are a bit misleading, especially when put up against the data Eric Hoffmann provides comparing football coaches and professors. The fact that there can only be one head football coach, whereas there are dozens and dozens of tenured professors to some degree distorts the differences. But the larger point still stands. It's not just at institutions that ostensibly exist to "educate" students, of course. This is just an small example of the emphasis placed on entertainment, and on sports more specifically. The Wall St. Journal yesterday had an article stating that a handful of New York Yankee (a professional baseball team) players who are currently unable to play due to injury, represents a "payroll" of more than $100MM. Our athletes are rewarded with enormous sums of money, as are the top actors and singers. The owners are willing to pay, because the franchises themselves are worth hundreds of millions (in some cases, billions) of dollars. And it's not just the US of course. How much is Manchester United valued at? Its currently estimated to be worth $2.3 billion. Gerard Depardieu, a not terribly talented actor in my personal opinion, has abandoned France because his earnings put him into a tax bracket he finds confiscatory. Panem et circenses is a Latin expression that predates the US by nearly 2000 years. Really don't see how wasteful spending on football is related in any way to racism, whether directed at Asians or anyone else. Both problems are real, of course, but derive from separate fonts, and thus, should provoke separate solutions, IMHO. "Schools" put money into athletics because they see value derived from them. The football team in many cases (the big football schools) generates money that funds other sports and their attendant "scholarships." Many of these go to female athletes, among others. I think some of this is used to mollify various political constituencies (e.g., Title IX) by providing opportunities to athletes who otherwise would not have them. I don't believe that athletics lend any sort of prestige to schools; not in anything more than the excuses given for why schools spend on them as they do. STEM funding, OTOH, while an important part of the university, are hardly the alpha and omega. One could just as easily compare the spending of money on sports and "legacies" (it will be interesting to check back with you in 10 or 15 years when the alumni pools at places like HYP are highly distorted from the general population to favour Asian-Americans, to see if this criterion remains a bugbear for you) to ask about emphasis on non-scientific disciplines. Philosophy, history, and the like. With respect, your point remains more valid if you restrict to schools like MIT or Cal Tech, whose main mission is (or ought to be) STEM as opposed to say, Cal Berkeley or Princeton, for whom STEM is just a single component of their respective academic missions.